For any user of a personal computer printer is a necessary device. Especially for those who print documents or photos. For printing always spend a lot of paint. And often you face a choice: to send or not to print another batch of photos. It may happen that the photos sent to the printer, and it was paint. And photos printed with the marriage. How to check the amount of ink in the printer? Unfortunately, the Windows operating system is not universal way to check the level of ink in the printer. All depends on the model of your device. The first thing you can do is to read the passport of your printer and its documentation. There are usually prescribed methods of checking the level of the paint. You can see the amount of paint on their own, without reading the documents. If your model has this option, you can find it in "Properties". To browse through the menu start, log in to the control Panel. Then select the tab "Printers" either from control Panel or in the tab "Hardware and sound". When you open the printers window, double-click the left mouse button on the icon for your printer. In the opened list select "Properties". You will see a window with settings for your printer. Click on the tab "color Management". This tab should contain information about the level of the paint. If no such information, then the program device does not provide a preview of the level of ink in the printer. Then it remains to focus on the quality of printed document. If the image is pale, or not fully stamped, or in the middle of the sheet is a white stripe, you can be sure that the ink in the printer at the end. Therefore, you need to refill it or buy a new cartridge. 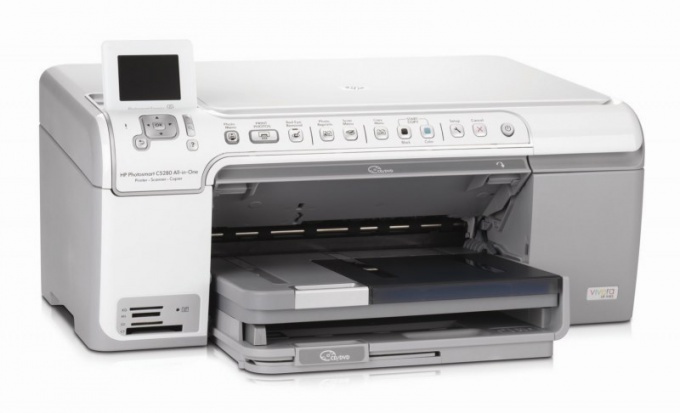 With many models of printers are available disks that have the software that allows real-time to see how much is left of the paint in the printer. Therefore, before printing, install the utility from the disk and drivers.